ANNOUNCING THE HEALTHY-DIET EXCLUSIVE COOKBOOK GIVEAWAY! Keep reading to find out how two lucky Fitness For the Rest of Us readers will win signed copies of the Now Eat This Diet Cookbook! Going on a diet does not necessarily mean saying farewell to all of your favorite foods! Award-winning celebrity chef Rocco DiSpirito changed his life and his health-without giving up the foods he loves or the flavor. He has lost more than 20 pounds, participated in dozens of triathlons, and-after an inspirational role as a guest chef on The Biggest Loser-changed his own diet and the caloric content of classic dishes on a larger scale. In NOW EAT THIS! 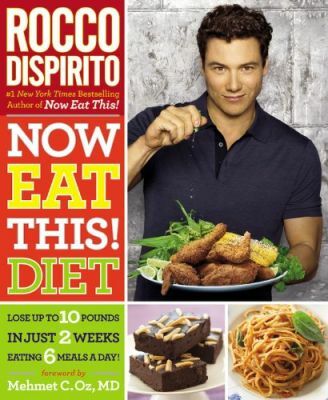 DIET, complete with a foreword by Dr. Mehmet Oz, DiSpirito offers readers a revolutionary 2-week program for dropping 10 pounds quickly, with little effort, no deprivation, and while still eating 6 meals a day and the dishes they crave, like mac & cheese, meatloaf, BBQ pork chops, and chocolate malted milk shakes. The secret: Rocco's unique meal plans and his 75 recipes for breakfast, lunch, dinner, dessert, and snack time, all with zero bad carbs, zero bad fats, zero sugar, and maximum flavor. Now readers can eat more and weigh less-it's never been so easy! Head to Amazon.com to get your copy and don't worry about getting it messy in the kitchen cooking 6 meals a day because you can win a pristine hand signed copy direct from Rocco himself! Rocco has generously donated 2 signed copies of Now Eat This! Diet to give away to my lucky readers!! Whether you're chosen as a lucky winner or not, Rocco shares exclusive healthy tips from his latest cookbook and recipes from his Twitter account so be sure to follow him @RoccoDiSpirito. Also, feel free to use the hashtag "#choose2lose" on Twitter if directing to the contest! Mandatory Entry: Answer the following question in a comment below "What's motivating you to eat right this summer?" Let us know below and also share which recipe from the Now Eat This! Diet Recipe APP you think would help you!" For example, some are motivated to eat right and lose weight for an upcoming vacation and they would love to try the "Chicken & Cheese Poppers" because it uses whole wheat flour instead of regular flour and still tastes delicious. And don't forget to leave your email address.
" #win @RoccoDiSpirito cookbook #choose2lose cookbook http://lindseylu8.blogspot.com/2011/05/now-eat-this-diet-cookbook.html #giveaway "
Entries will be accepted until 11:59 pm on 5/23 and the winner will be selected using random.org random number generator and annouced on 5/24. Remember 2 entries = 2 comments (so for blogging about this you would leave 5 separate comments). Contest open to US Residents! Good Luck! I follow your blog via GFC sariade at yahoo dot com. I follow Two Belles via GFC. sariade at yahoo dot com. I entered the Paul Katami giveaway. sariade at yahoo dot com. I want this cookbook because the recipes look delicious and they're healthy! sariade at yahoo dot com. Wearing a bikini is my motivation, I am a total bread addict so the crunchy tomato bread sounds delish!! I am motivated so I can look good when my husband gets back from his deployment...the pizza egg bake looks amazing! Wanting to wear a bikini after having two kids is motivating me! Steak and salad looks great! I like fitness on fb. Being able to look nice & feel comfortable in my own skin is what's motivating me to eat right this summer. I think the Crunchy tomato bread could help that because it uses whole wheat bread as well as olive oil. I want this cookbook because it has some great recipes that can help me eat right. My motivation for eating right this summer is the desire to be around for a LONG time for my kiddos. I believe all of these recipes could help because they are all made from healthier ingredients. This cookbook would help make my goal of eating healthier much easier for myself and my family because he takes "normal" recipes and makes them out of healthier ingredients, so my kids would be eating the same foods, just healthier. I think this would be much easier then going ultra "diet" on them and trying to get them to eat "diet" food. Wearing shorts and swimsuits in the summer motivate me to want to eat good to feel good. Sweet Potato Casserole looks like a yummy dish that would get me my healthy vitamin A and keep me full. My motivation is health, I Need to take off my extra weight to improve the quality of my life. I would love to try the fried cheese balls. What is motivating me to eat right this summer is that I want to lose 60 pounds and actually be able to wear and look good in summer clothes. I really liked the recipe for sliced steak with Spinach and Tomato Salad. It is lean, cool and yummy looking. I want this book because I have been a big fan of Rocco’s ever since he first started appearing on cooking shows and I have seen his health transformation. I want to emulate him in a much smaller way and one way is to be able to utilize the recipes and advice given in this book. I have my 10 year high school reunion coming up in 2 weeks and I would try the fried cheese balls. My motivation is my desire to have a baby. Time and anatomy are against me, so losing weight is something I can do to increase my odds. My 25th class reunion! The Sweet Potato casserole sounds very healthy & tasty! Heading to the beach this summer.I really liked the recipe for sliced steak with Spinach and Tomato Salad. Summer is approaching, so I need to lose weight. The Chicken & Cheese Poppers sound great. I want it to help me lose weight. Being healthier and feeling better is my motivation.